Fentanyl, a synthetic opioid painkiller sometimes prescribed to treat severe pain in cancer patients, is showing up more and more on the street. A study conducted by Canadian researchers at the Insite Supervised Injection Centre in Vancouver found that approximately 80% of heroin tested at the site from July 2016 to March 2017 had been contaminated with fentanyl. Vancouver’s Insite is a center that allows drug users to inject intravenous drugs legally and under supervision from medical personnel with sterile equipment. Opened in 2003, the center is part of a “harm reduction” strategy that aims to reduce overdose deaths and transmission of diseases from dirty equipment. It is the only center of its kind in North America, though Seattle is working to open the first in the US. The researchers found that 80% of the crystal meth and 40% of the cocaine tested at Insite were also contaminated with fentanyl. Researchers tested more than 1,000 drug samples, asking Insite clients whether they wanted to test their drugs voluntarily. About five of the center’s 600 daily visitors tested their substances, according to Dr. Mark Lysyshyn, the medical health officer for Vancouver Coastal Health and the lead researcher on the study. Though fentanyl is legal and sometimes prescribed by doctors, it can be extremely dangerous. The drug, which is available in a patch or liquid, is 80 to 100 times as powerful as morphine and about 40 to 50 times as potent as pure heroin. Insite isn’t the only organization to notice a spike in fentanyl use. The Drug Enforcement Administration said in April that, while fentanyl has become more common since 2013, it has seen a noted spike since the beginning of 2016. Drug producers and traffickers, the DEA says, are increasingly mixing fentanyl illegally produced in underground labs with heroin or ostensibly prescription pain medications like hydrocodone or oxycodone. “Because it can multiply exponentially, multiply your proceeds, we’re going to start seeing some, we just haven’t yet,” DEA agent Brain Villella told the local Vermont NBC affiliate MyNBC5. The DEA warned in its 2016 National Drug Threat Assessment, released in December, that the opioid crisis had “been exacerbated by the national reemergence” of fentanyl in other street drugs. 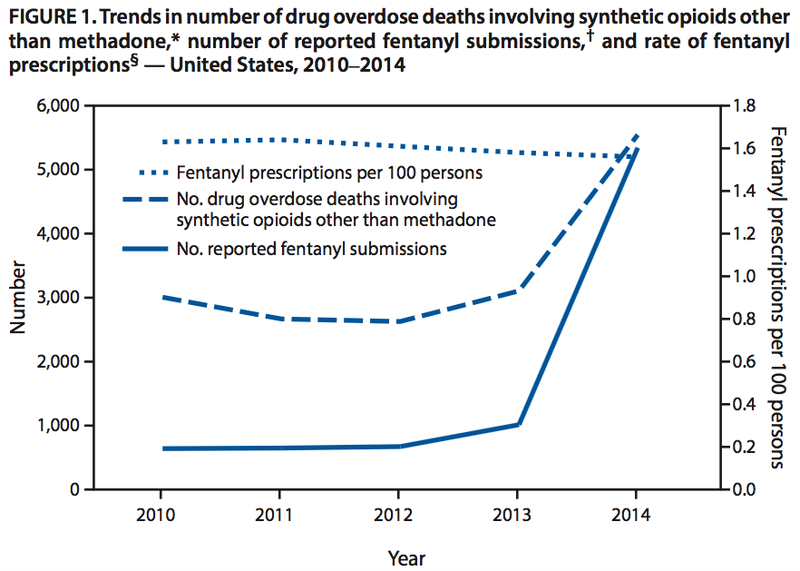 The reemergence was reflected in a rise in overdose related deaths. The overdose death rate for illicitly obtained opioids like fentanyl skyrocketed by 73% from 2014 to 2015, according to a Centers for Disease Control and Prevention report released in 2016, and 79% from 2013 to 2014. The increase in the prevalence of fentanyl led to a flood of overdoses last summer in Ohio, Kentucky, and West Virginia. Last August, the Cincinnati police reported more than 60 overdose cases in two days. About the same time, Huntington, West Virginia, reported 26 overdose cases in four hours. Similar outbreaks, which law-enforcement officials blamed on fentanyl, occurred throughout the summer. In the Insite study, approximately 80% of the drugs checked were heroin, while crystal meth represented 7.2% and cocaine represented 5.3%. Lysyshyn told the Vancouver Sun that the results of the study should not be interpreted to mean that 80% of street heroin in Vancouver is contaminated with fentanyl. While the percentage could be that high, he said, it is most likely lower because people are more likely to test drugs they already suspect to be contaminated. Still, the study is more troubling evidence that fentanyl is becoming more and more common on the street. “This study proves that the alarm bells that have been sounding over this public-health emergency are fully warranted,” Rick Lines, the executive director of Harm Reduction International, said in a statement.